edie's parent company, Faversham House, also publishes a stable of business-to-business magazines aimed at the specific needs of environmental professionals. To find out which of edie's sister publications are right for you, follow the links below. The leader in its field, Water & Wastewater Treatment is an independent monthly magazine whose readership spans professionals in the water and waste water industry. The editorial brief provides an exciting and authoritative commentary on the state of the water industry, bringing the reader a lively mix of news, case studies, new products and technology, plus special reports and features. Areas covered include the whole of the water cycle - clean water to dirty - as well as industrial effluent treatment, river and water resource management and environmental legislation. Water. desalination + reuse, published with the cooperation of The International Desalination Association has been serving the world's growing need for water since 1991. Fast emerging technologies are now making desalination a viable proposition not only for the arid areas of the world but for places not usually associated with water shortages. Water. desalination + reuse covers the engineering aspects of desalination and water reuse from municipal water supplies through to industrial needs. It delivers practical information and news on projects, materials and equipment and research with sections devoted to the International Desalination Association and IDA affiliates, worldwide. Water. desalination + reuse also publishes an annual Desalination Sources Directory which lists, comprehensively, details of suppliers of equipment, products and services for the desalination industry. Monthly tabloid WET News is the voice of water industry contractors, delivering the specialist information that they require to operate efficiently, cost-effectively and profitably in an ever changing market place. WET News recognises that these contractors are important buyers in the industry and, through its lively and authoritative editorial content, ensures they are up-to-date about the new products and services vital to their needs. Who's Who in the Water Industry 2014 is an essential guide to the UK water industry and those who shape and influence the sector. 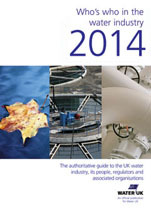 Compiled by Water UK for the industry and its stakeholders and published by Faversham House, Who's who in the water industry 2014 is an invaluable source of information for the industry. A popular feature of past Handbooks was our 'Who's Who' section, including biographies of all the key movers and shakers. Due to popular demand, this is back for 2014!